Texas’ court-ordered $2.5 million voter education campaign failed to prevent widespread confusion about the state’s identification rules ahead of the 2016 General Election, according to a new study. Texas’ court-ordered $2.5 million voter education campaign failed to prevent widespread confusion about the state’s identification rules ahead of the 2016 general election, according to a study released Monday. And such a misunderstanding may have kept some eligible voters in key political battlegrounds from showing up to the polls, the University of Houston study found. A federal judge last year ordered the Texas Secretary of State’s office to spend $2.5 million educating Texans about its voter ID requirements ahead of the 2016 elections. The requirements were relaxed after a federal appeals court last year ruled that Texas’ strict 2011 ID law discriminated against minority voters. The education efforts — a mix of television and radio advertisements and online media — fell short, the research suggested. Sam Taylor, a spokesman for Secretary of State Rolando Pablos, declined to comment on the study, citing pending legal battles over the state's voter ID law. (Pablos was sworn in two months after the November elections). Researchers surveyed hundreds of registered voters who chose not to cast ballots in two “purple” regions, those with hotly contested races between Republicans and Democrats: sprawling Harris County and Congressional District 23, where Rep. Will Hurd represents an area that stretches from San Antonio to El Paso and takes in most of the Texas-Mexico border. Nearly 60 percent of non-voters surveyed in both jurisdictions incorrectly believed that everyone who showed up to the polls was required to present approved photo ID, the study said. They were unaware of a court-ordered fix to the state’s 2011 law, which allowed those who could not “reasonably obtain” such IDs to present alternative documents. Latinos surveyed were substantially less likely than whites to accurately understand the requirements, the study said. Just over a dozen of the 819 non-voters surveyed lacked a photo ID required under the strict 2011 law. Nevertheless, roughly one in seven flagged a lack of photo ID as a reason they did not vote, while about 1 percent of non-voters said it was the main reason they did not show up. “If [Texas] just used rules similar to those enforced in 2016 but did a better job educating voters, we would see only very modest adverse effects on participation,” Jones said. The survey results tracked similarly to findings in a 2015 joint Rice University and University of Houston study of CD-23 that found eligible voters stayed home because they erroneously thought they lacked proper IDs — possibly factoring into the outcome of Hurd’s close win over Democrat Pete Gallego. Jones called it unrealistic to expect the secretary of state's office, previously led by Carlos Cascos, to educate would-be voters across the vast state with just $2.5 million — a sum better suited to reach folks in just one of Texas’ 36 congressional districts. A federal judge ordered Texas to launch the voter education effort just three months before Election Day last November, and the campaign hit an early speed bump when that same judge ordered the secretary of state's office to correct and re-issue press materials following allegations that the office inaccurately described fixes to the ID rules. The agency at the time called educating voters its top objective. Researchers can't analyze how effectively the agency has used its scarce resources for education because it has refused to release key details about where it purchased television and radio advertisements to publicize the relaxation to ID requirements in the run-up to the elections — secrecy supported by a ruling from Attorney General Ken Paxton. That lack of disclosure has angered some Democrats. Legislation filed by State Rep. Justin Rodriguez, D-San Antonio, would require the agency to make such information public. The House Committee on Elections discussed the proposal — House Bill 3285 — at a hearing Monday. The secrecy has “hindered our constituents' ability to hold state officials accountable," Rodriguez told the committee. Keith Ingram, director of elections under Pablos, said his office did not take a position on the bill but is concerned it would expose trade secrets of private media firms who contract with the state. “Each of the vendors who put bids in for these contracts have kind of their own secret sauce,” he said. 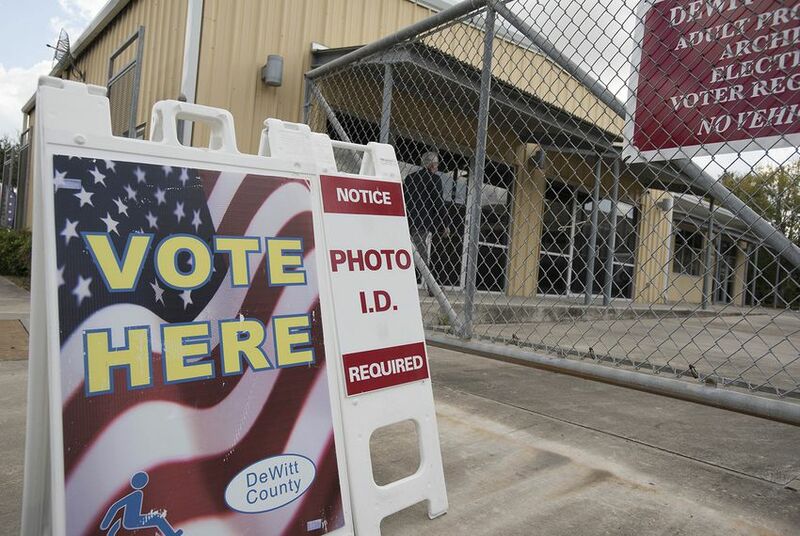 The Texas Senate has approved legislation that would revamp the state’s voter identification rules, a response to court rulings that the current law discriminates against minority voters. Disclosure: The University of Houston and Rice University have been financial supporters of The Texas Tribune. A complete list of Tribune donors and sponsors can be viewed here.